After transplanting, the pepper plants seem to sit and do nothing for a few weeks. Although they may not seem to be growing very fast, they are putting out roots and preparing for an enormous surge of growth. Sometimes there will be leaf damage from the sun and wind until the plants totally adapt to being in the ground. A wide variety of mulches has been used with peppers, and determining the one that is right for the home garden depends upon a number of factors, including climate, decomposition of the mulch, and the use of colored mulches to increase yield. Gardeners should remember that since mulching warm soils keeps them warm and mulching cold soils tends to keep them cold, the mulch should be applied after the soil warms. Materials. Lawn clippings, leaves, straw, compost, bark, wood chips, and pine needles have all been used for mulching peppers. They do not affect soil temperature very much, but they are effective in controlling weeds and maintaining moisture in the soil. They should only be used in regions wet enough to allow them to decompose into the soil. Otherwise, hard-to-decay materials such as wood or bark chips will have to be raked out of the plot each year prior to rototilling. Some growers believe that grass clippings are particularly helpful because thick layers of them can be thoroughly saturated to increase the humidity around pepper leaves and flowers in dry weather. However, this practice sometimes promotes pepper diseases. Clear Plastic. 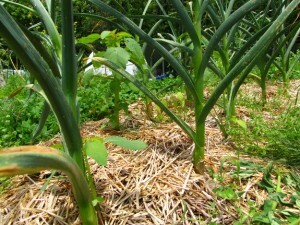 This mulch warms the soil by about 10 to 12 degrees but does not control weeds. It should not be used in hot climates. It is not biodegradable and must be removed at the end of the growing season. Black Plastic. 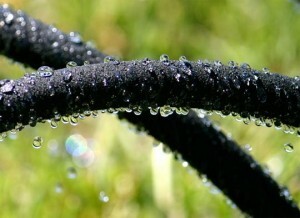 Excellent for controlling weeds, black plastic also warms the soil (up to 5 degrees) and is good for moisture control. It also should not be used in hot climates because it may overheat the plants. Black plastic does not decompose and must be removed at the end of the growing season; however, there are some brands of black plastic which do decompose. Researchers at the University of New Hampshire have developed a black plastic mulch with the heat-transmitting qualities of clear plastic. It’s called IRT Mulch (for Infra-Red Transmitting) and it is available from mail order companies and garden shops. Foils and Colored Plastic. Louisiana researcher L.L. Black discovered that aluminum foil produced higher yields of bell peppers than ordinary black plastic. Reflective mulches also drastically reduced aphid infestations in peppers, thus lowering the incidents of aphid-transmitted viruses, such as tobacco etch. Black’s findings showed that plants in aluminum foil plots yielded 58 percent more than those in black plastic plots and 85 percent more than unmulched peppers. Further experiments by Wayne Porter and William Etzel at Louisiana State University confirmed that aluminum-colored plastic works very well. “The increased yields were probably due to increased light reflection of the aluminum-painted polyethylene,” they wrote. Some gardeners have good luck with laying aluminum foil between their rows of peppers to increase available light. This practice should only be used in humid climates. If used in the Southwest, for example, with its dry air and high levels of ultraviolet light, the plants would bake. Robert Dufault and Samuel Wiggins of the University of Vermont’s Horticultural Research Center experimented with white plastic mulches on Bell peppers and they discovered that the yield of white-mulched peppers was 35 percent greater than those left unmulched. Michael Kasperbauer and Patrick Hunt of the USDA’s Coastal Plains Research Center in Florence, South Carolina, experimented with the effects of black, white, red, and yellow mulches on bell peppers. The plants grown on the red mulch were taller and heavier than those grown on the other plastics. Their theory is that the phytochrome protein in peppers and other plants is a biological light sensor that responds to red light, particularly far-red, which is beyond the range of human vision. Since plant leaves reflect far-red light, when a mulch reflects far-red, the plant reacts as if competing plants are nearby and puts out more leaves and grows taller. Some mail order companies and garden shops are selling three-layer weed mats that prevent weeds but let air, water, and nutrients through. Newspaper and Other Paper. A favorite mulch, which works especially well in the Southwest, is ordinary newspaper. Although the sheets must be weighted down with soil to prevent them from blowing away, the newspaper retards weeds, reflects more light than black plastic, holds moisture in the soil, and can simply be rototilled into the soil at the end of the growing season. Use a thickness of at least two sheets after the transplants have been set out. Avoid using colored newsprint because it takes longer to decompose. Some gardeners opt for brown paper from shopping bags, cardboard (which works best in a flat garden), and black, biodegradable paper mulch made from peatmoss and recycled cardboard, which can also be rototilled. The latter works well in cold climates.Simple experiments have revealed that doubling the water applied to peppers doubles their yield–to a point. If the ground becomes too saturated, it may either suffocate the roots or promote fungal diseases. Adequate watering increases yields and makes the peppers better tasting. Some pepper gardeners are fortunate to live in areas where the only water needed for the garden comes from rainfall. But most gardeners will have to irrigate their moisture-demanding peppers. Gardeners should adjust the frequency and amount of watering to rainfall cycles. In other words, do not irrigate if there has just been a heavy downpour. Rainfall can be deceptive because sometimes it thoroughly wets the mulch but does not penetrate to the deeper roots of pepper plants–some of which are two feet below the surface. Also remember that peppers grown next to large, water-demanding plants, such as corn, may need extra water. We learned an important lesson about watering in our 1992 home garden. One of the New Mexican varieties wilted and died, apparently from phytophthora, but none of the other thirty plants in the garden showed any wilt symptoms. We assumed we were overwatering and restricted the water. The result? Three other plants were stressed from underwatering and nearly died. So the fact that a single plant wilted misled us into a false assumption, and the simple fact remains that occasionally a plant will die from a disease that is not prevalent in the entire plot. Following are some common watering techniques. Sprinklers. Overhead sprinkling works fine when the plants in the garden are small. But once they gain some height, the water from the sprinkler is blocked and the garden is not watered evenly. Because it is awkward to keep raising the sprinkler above the foliage, at this point another watering method should be used. Flood Irrigation. This method, which simply floods the garden with water from a hose, works well in a garden with good drainage, and is recommended for ridges and furrows, flat beds, and modified irrigated beds. The gardener should carefully watch the amount of time it takes the water to drain from the plot and adjust the amount of water applied to avoid over-irrigating. After the hose is turned off, the water should drain from the garden in less than an hour. If it takes any longer, too much water has been applied and the gardener should use less water more frequently. Soaker Hoses. Also called “drip hoses,” these leaky hoses are made from recycled tires and can replace drip irrigation systems (below) in smaller gardens. If the water pressure is too high, they tend to rupture and sent sprurting water all over the place. However, this can be controlled by placing heavy mulch, such as wood chips over the hoses to retain the water in the garden. Dave uses this method in his raised beds, and it works well–it’s also an inexpensive system. A number of studies of trickle-irrigated chile peppers in New Mexico indicated that it is the amount of water applied that increases yield–not the method of applying the water. Gardeners using drip irrigation should take care that the soil around peppers remains moist but not wet. They should also have a backup system in case the drip system fails.